“I’ve been having an amazing week food wise and I wanted to give you the props you deserve!! Over the fall and winter, I did not eat well AT ALL. While my calorie intake wasn’t high and I was exercising regularly, I wasn’t making very good food choices, so I gained 10 pounds from September to mid May. I’m just barely 5’5, so those 10 pounds made my clothes not fit (I couldn’t button my pants and shirts with sleeves were too tight in the arms!) and my self esteem plummeted. I raced on 5/17 and most of my triathlon clothes did not fit – at all. I just felt awful about myself. Well, last week I got sick of feeling bad – the turning point was when I realized I was calling myself “[Fatty Patty]” and it was no longer a playful jab at myself. So I pulled out my Detox Plan For Athletes book, stocked my fridge with fresh veggies, did some food prep and put the booklet to use. 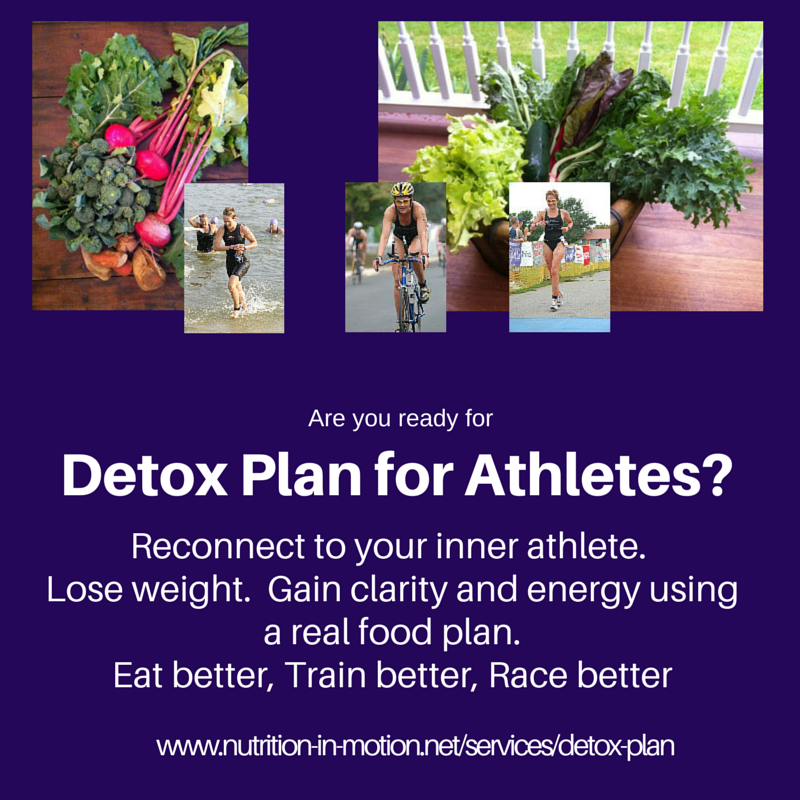 I followed the detox [plan for athletes] strictly for three days. After those three days, rather than following the diet perfectly, I put the knowledge of food and how to eat that you’ve given me over the years to good use and just ate the way I should. Since Wednesday, I have lost 5 pounds and feel amazing! It has been less than a week, but I’ve found so much comfort in the lessons about food you’ve taught me through the years and have been amazed at how quickly I’m dropping the weight!! I’m not starving, I have energy, the highs and lows from sugar have stopped, I am no longer craving carbs and, most importantly, my clothes are starting to fit again!! This comes from one of my client who I had no idea was doing the Detox Plan for Athletes again on their own. This email came as a wonderful surprise as I love when clients find inspiration and when they feel better – about themselves as well as in their own clothes! If you are sick of feeling bad, give the Detox Plan for Athletes a whirl. There is also the original 2 Week Detox Plan and the Mini Detox Plans, too to suit your needs. They are all real food based although may have some supplement suggestions if needed.